Installing a wood bath tub might be thrilling for you and a little worrisome for your contractorif he is doing it for the first time. Actually, installation, use and maintenance of a hinoki bathtub is very straightforward and you will be surprised how simple it is. Please look at the FAQ`s below and feel free to ask anything you do not understand. normally made for 2 people? It depends on the size of the tub and ... how intimate are the 2 people using the tub. The round outlet tub is 3ft in diameter (external size) so I think it works best for one person. You may make a test in a tub you own or create a mockup in your living room using a corner of the room and the back of a sofa, or some cardboard boxes to simulate the size. We can build the size to match your specs so it can fit your needs/space in the most efficient way. For the insurance I understand from your webpage that for transportation the stuff is insured and it needs to be checked within a certain period after arrival. And there is a 1year guarantee on manufacturing work, guess this means cases where eg. dowels break or cases like that? Shipping insurance: as you say, it is included, in case there is any problem just be sure to report it asap. Just for your reference, until now we did not have one single damage report. 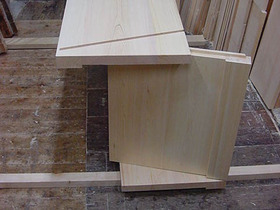 Guarantee: please note that we cannot provide a guarantee on hinoki tubs. The wood is very sensitive to environmental conditions and we cannot be responsible for any damage caused by dryness, mold or detergents. We will do our best to assist with any problem, but are simply not able to implement the conditions for a guarantee on the product. Of course if there is a construction problem or execution miss we will repair or replace the tub. Please note that in over 12 years (201 tubs delivered worldwide) we replaced one tub (non compatible water-repellent) and repaired one (dead knot). 1) As you know, japanese onsen are usually not equipped with jets. Often there are some shallow "bed type" jacuzzi tubs for individual use. - use the tub at least 3 times a week. 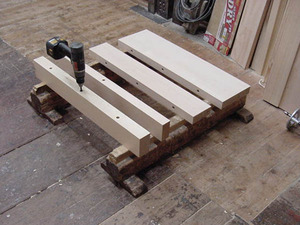 This routine restores the optimal wood humidity. - leave some water inside the tub and cover it. On the other hand, if you are planning to attach the drain to the plumbing using an elbow, the "feet" under the tub will interfere with it. If you let us know the direction in which the elbow will be pointing, we will calculate the offset and place the drain accordingly. Hi, I have been admiring the products in your website. -When I measure my partner's body, from her seat to just-above shoulder height measures 24". Including a small seat in the tub (say, 8"H), brings the interior dimension of the tub to 32"H. It seems that in order for her to soak without slouching her posture, the depth of the water would have to be at least 32"H. Therefore I imagine the exterior measurement (including feet or supporting slats) would bring the tub to around 34"H. Yet the deepest (standard) tub I see in your listings measures 690mm H, which is about 27 inches. Can you please explain why the depth is as you have listed, and not greater, per the above situation. My partner is about 5'-6", so she is about average height. Actually traditional japanese bathtubs do not have a seat. To have the full bath, you can sit in the tub on the opposite side of the seat . Alternatively, you can remove the seat plank. Also consider that when you relax in the tub, rather than keeping a 90 degrees sitting posture, it is easier to slide a little forward until the feet touch the other side. (This is also why the tub should be not too long) In this case the shoulder line lowers a few inches. - you will need more hot water each time. underfloor heating and heated towel rail!! Heating in the bathroom can damage your tub. This can be solved by keeping water in the tub at all times (during the heating season). Cover the tub to avoid condensation and mold in the bathroom. The tub may get some stain also, but the hydro-repellent treatment we apply makes it easy to clean. We cannot make a clear statement for your situation (recommend or not recommend): you have to consider the options and the risk involved. On the other hand, some some counties building dept. require compliance with the ASME regulations. Our tubs are not ASME certificated, so you should either file it as a "soaking tub" (not sanitary equipment) or contact us for more options. I love your website and I can't wait to order a bath of my own one day soon. I do have one question: I live in the UK in an area with very hard water (high calcium content from the chalk in the ground) - will this affect the care or lifespan of the Hinoki bath? we can say that there is not too much to be worried about. Hi -- We've already bought a bucket and stool from you to go with a tub we had made here out of what the guy who made it called "American hinoki-type cedar" (it smells a little bit like hinoki -- we lived in Japan for a few years so I remember what it smells like). I have a question: the tub went for a full year without water in it and the wood is now very cracked. Is it possible for cracked wood to close back up? If not, we will probably order a tub from you; they look beautiful. If we do, is it possible to put the hole for the drain in the center of the tub? That is where it was on the last one and where the drain is centered in the place for the tub in our bathroom. I guess even if we go with a standard S3 size, having the drain in the middle would still make it a custom tub? Thank you for your interest in our japanese bahtubs! About your existing tub, thank you for the pictures. On the other hand, if you re-hydrate, chances are it will be usable again. leak anymore. Let dry for 1 day. 2) Fill the tub with water and let it full for 2 days. will have squeezed out from the cracks. Cut it flush with a cutter. The tub should be OK and not be too bad aesthetically also. you for a new tub. If you decide to replace it, of course we can match the center drain. Actually we can also match the tub sizes if necessary. Basically all our tubs are made to order so there is no difference in price between standard sizes and custom sizes. We have a standard size pricelist for pure reference. We have termites in our area which is one block from the beach and thus fairly humid as well. Should we therefore use the Asnaro wood? When it's wet, does Asnaro also have the pleasant aroma like Hinoki? What is the feedback from your customers in Singapore - regarding mold experience on the bathtub. I am very worried about this, because here everything gets moldy, even shoes. "KIHADA ICHIBAN" is applied by brush or roller. It does not create a coat, it actually penetrates inside offering lasting protection whithout occluding the pores of wood. 2) treated with "kihada ichiban". This product is a hydrorepellent which does not create a film on the wood. It is very safe and environmental friendly but it is a chemical product. What is the difference between hinoki and "Port Orford cedar" (Port Orford cypress, Oregon) for asthma? 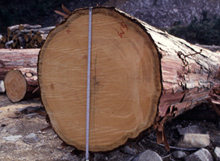 What is the difference between asnaro and hinoki wood? * hinoki: white/pinkish, with a delicate lemon scented aroma. more expensive. more delicate (because it is lighter). Japanese are crazy for hinoki because of its "pure" image. * asnaro: nice honey color. It has a stronger forest aroma. 20% cheaper than hinoki. Easier to maintain (because is slightly tanned and because contains more hinokitiol oil). Popular for export for its color and cost-performance. Are your outlet tubs new or second hand? Our outlet tubs are brand new, spotless tubs that were wrapped in poliethilene sheet from the very day they were completed. 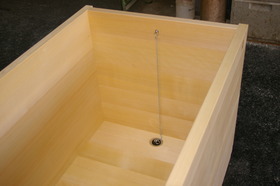 An outlet tub is about 20% cheaper of a custom order tub with the same size/material. This does not mean in any way that those tubs are faulty or old. 1) The tub was custom ordered and the client either canceled the order or asked for a size/shape modification that required a new start. 2) The tub is made optimizing some material we have in stock, in most cases left over from a larger job. We can define the sizes of the tub based on the length of the material we have - minimizing the loss - as opposed as cutting longer planks as we have to do for a custom order tub. minimize the necessity of a top frame border. Lastly, we can work on a free schedule, between one job and the other. This are the only reasons our outlet tubs are affordable and the core concept of our double-smile system: you are happy, we are happy too ...! Recently, in the land of "up to the shoulder soaking" is becoming popular the half-body bathing (keep the water up to the waist). We do enjoy our hinoki tub, although we have had some minor cracking with some black growth on the outside of one of the corner joints. We've also found that hair and skin cells seem to stay floating on the surface even though we always shower before entering. I am enjoying my tub, which is installed on a deck outside my house. I was wondering if it is OK to put some sort of sealant on my tub, like the kind of sealant one would apply to teak wood, for example. Or, should I just leave it as-is and cover it up to make sure it doesn't age too much because of the sun, etc. 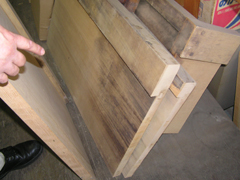 - Due to the oils contained in the wood, the coat may not stick uniformly and may detach. Consult also with the maker of the coating product. Thank you. If I do not treat it, will it deteriorate more quickly than if I treat it? I like the way it is but am worried about it deteriorating. I am having a cover made for it to keep it out of the weather. However, it got quit a bit of sun last year and cracked in some places. It does not leak, and the cracks are probably natural and not a problem. I like the way it looks now that it has aged for one year. I just wanted to make sure that I'm not supposed to be treating it with something. If there is a natural oil that I should apply, please let me know. I am a specialty contractor in Seattle Washington and a Japanese friend of mine who has a Hinoki Ofuro says that it leaks. I took a look at the tub and all the boards look in good condition, but my friend says that the water leaks between the boards at the seams. Your website mentions in the question and answer section that cracks can be fixed, but it changes the asthetics of the tub. Does the tub need to be taken apart and resealed or is there a way to stop seam leaks with some other product? Any information that you could give to help save this wonderful tub would be greatly appreciated. 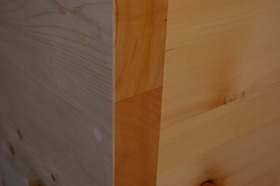 Hinoki tubs do not leak unless there is a crack in the wood. 1) simply clear silicon: it allows movements of wood and it becomes invisible as the crack closes again after normal humidity level has been restored. 2) epoxy putty: it is water resistant and with color similar to wood. But as it is hard, wood balance becomes altered. Another cause of leaks is poor joint construction. There is not much you can do about it apart for caulking all the inner corners (floor and walls. )Use mildew-proof clear silicon. It is very difficult to disassemble the tub and most surely you will have to replace some parts. It might be worth the work if you create double tongue/groove rims at every joint but again, the main problem is whether it can be taken apart without damage or not. I also have a technical question: What happens if, due to excessive heat the wood happens that a horizontal crack appears in the floor of the tub? Is this repairable in a manner or another? Please let us know. About the the horizontal crack: please send me a detailed picture. Is it in the joint between planks or in the middle of a plank? Do you think it leaks water? Did you leave the tub dry for long periods? Once we see the picture we will be able to give you better advice. Concerning the crack, I went back to the site this morning and took some shots I am sending to you herewith. - yes we left the tub dry sometimes, and moreover, a week ago we put in service a floor heating that is underneath the tub but also around it. It might have dried the air in the room. Added to a very warm summer here. Timing of that problem is quite bad since we were ready for handing over the project to the owner client the 1st of september. I see: the problem is definately the floor heating. 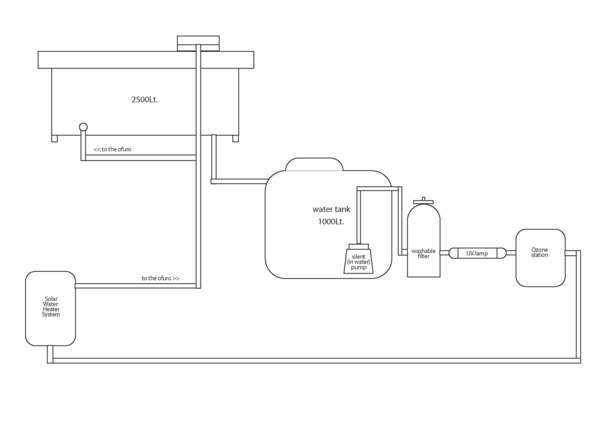 In general every heating system in the bathroom is bad for the bathtub. It dries up the wood especially if it runs for many hours a day (like central heating systems). Of course it depends also on the width of the bathroom and height of the ceiling, in any case, we recommend to keep an hygrometer in the bathroom and check regularly. Floor heating is even worse for the wood tub because the heat tends to concentrate towards the floor and the humidity is washed away systematically as hot air moves upwards. I recommend to use an underwater epoxy sealant. It should be pushed into the crack with a spackle, to fill it up completely. You may finish the last 1mm with underwater epoxy putty which has a color similar to wood. I could sent you this material by EMS mail but it takes over a week (now customs are full because of holiday period tail). If you need to repair before sept.1 , try to look for this material locally and let me know if you have problems. Also, remember not to use the heating when the tub is empty. If you need to, fill the tub with 10cm of water and use the heating without fear. I think it would be wiser if you send me the underwater epoxy sealant, and the underwater epoxy putty, that you have already used, and that has already given good results. If you can do it as soon as possible, and send me the invoice for immediate payment, I would appreciate it a lot. I checked with my carpenter and he recommends no putty, just make the epoxy fully penetrate. It has a greish color. after it is dry, you can sand or plane it. This morning we sent you an EMS parcel. Please let me know if you could fix the problem. Thank you very much for your product. We received them last wednesday, and the result seems good for the moment. No more leaks! From the aesthetic point of view, the repair is ok. Sure the color is grey and you can see it if you know it is there, but it is not shocking at all. I will send you a photo tomorrow. We have not used the hiba oil on the tub yet, but it smells so great in the water. 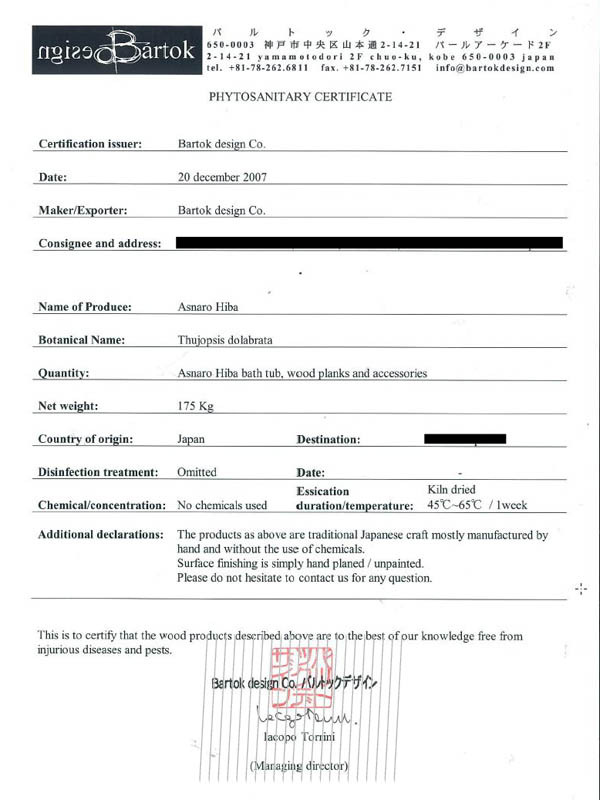 My builder also enquired if it would be possible to get something like a VAT registration statement in respect of Bartok Design in Japan, if such a thing exists in Japan (it can be in japanese, I can get it translated locally). Or is this information going to be contained on the invoice? This is becase - I assume - since the tub was produced for export, there would have been no VAT or equivalent sales tax chargeable in Japan, but it will fall to be paid by me once I take the house with the tub in it from the builder. The builder would like some sort of documentation to support this. I understand what you are saying (a stamp stating that the shipper is VAT exempt is required for exports originating in Italy), anyway the japanese customs do not require it. The shipping is DDU terms (Delivered Duty Unpaid) which already implies that VAT is payable by the coinsignee. On nearly one hundred of shippings we were never required to provide this declaration so to be honest I am not sure how to make it. Of course I can add a "VAT unpaid in country of origin for exported products" declaration and send you the amended invoice. Is it enough? Do you have any specific requirement according to the format of this declaration? In recent years there there has been a strenghtening of the rules concerning packaging (crates, boxes). Shipments to Australia, China should be done in non coniferous wood crates otherwise they will be fumigated. On the other hand, shipments to California cannot use plywood crates due to a very recent restriction on products containing formaldheide. In any case, we receive constant updates from our forwarder so you will not have to worry about this matter. I visited your website. I really like the look and healing properties of your tubs. And, the craftsmanship seems outstanding. After reading about the hinoki wood and the few places it can be found, I was curious if the hinoki wood you are using is farmed or old wood. Is there concern about depleting it? Here in the Northwest United States much of our cedar is gone -- to the point of great environmental concern. I know Japan is protecting its forests as well. I'm curious about the current situation with the hinoki species. We use both cultivated and natural wood. It depends on the type of project, size, quantity etc. In any case, all the wood comes from sustainably managed areas, some are FSC certified (FSC tands for Forest Stewardship Council). Hinoki is a coniferous tree and the growth takes about 20-25 years before being commecially exploitable. 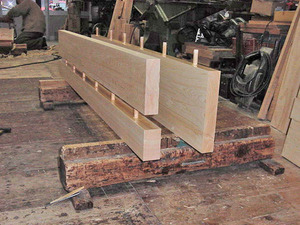 Farmed wood has the advantage of having few or no thru knots for an optimized usage of the material. May I ask why the corners of your tubs are 'T' shaped? 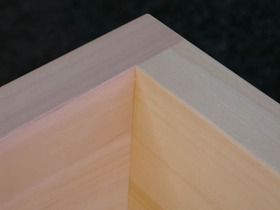 Can you make mitred joints? Also, there was a small accident while opening the crate. The damage I mentioned to you on the phone was only on the crate, and there was no trace of damage on the tub itself, so that is resolved. However, we used a hammer to loosen the side boards of the crate, and the hammer must have rebounced and hit the top edge of the tub on both sides, at the height of the brand. I'll send you the pictures when I get them on my computer from my neighbour. That means that we will probably have to sand down the whole top of the tub all around to make the marks disappear. Is that the right thing to do ? Are there special instruction for that matter as far as making the slanted edge, and/or treating the wood once sanded ? Is the wood treated, or is it only treated at the bottom ? Then we will require the balance 50% payment + packing charge + accessories if any (es. bucket, chair...) + transportation charge, as it was shown on the quote. Your site recommends 'pure warm water' Is a high salt content okay? My image is the salt pools I sat in at Spa LaQua. I am thinking of Israel Dead Sea Salts, or another healthy salt. 1) fill your hinoki tub with 5" of water and leave uncovered.